Nestled in the heart of the Green Mountains in Central VT, you will find the quaint New England town of Pittsfield. Chartered in 1781 the historic New England town attracts thousands of people who drive on scenic route 100 to watch the fall foliage and to relax in the countryside. Located just 7-miles from the Ski Resort town of Killington and 1 hour to a 1 1/2 drive from major Vermont cities and towns - Middlebury, Manchester, Burlington and Woodstock; Pittsfield is your gateway to a great Vermont vacation. Pittsfield invites visitors to escape to a good ol’ New England town that is full of charm and countless of opportunities to indulge in nature. The Original General Store is a quintessential General Store that promotes organic and local grown farmers as well as the purveyors of all fine Vermont products from Vermont Maple Syrup, to Vermont soaps and lotions (which are all hand crafted). 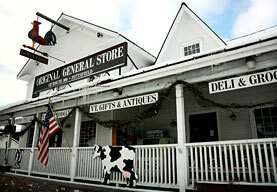 Shopping at the General Store is like taking a step back in time when "Hand Made", "Hand Crafted" and "Made In America" mattered - as it did then it still does now at The Original General Store, Route 100, Pittsfield. Keeping true to its charm, The Original General Store is a special place that will take you back in time when things were simple, neighbors knew neighbors and there was a strong sense of community. Shop at the eclectic store and become part of the neighborhood! 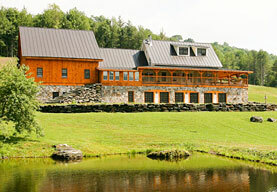 The Amee Farm is one of central Vermont’s most beloved hidden treasures. Serving as 40 acre organic farm for more than 200 years, The Amee Farm was fully restored in 2007 with forefront sustainable technology, including solar power, geothermal and alternative heating and cooling systems. The Amee Farm is a premier “green event” location. Managed by an organic and health food specialist chef, the Amee Farm can accommodate an array of social gatherings including but not limited to: corporate retreats, corporate meetings and dinners, crafting weekend with the girls, an outdoor adventure weekend with the boys, organic cooking and more. The Amee Farm utilizes food and ingredients from its fruit and vegetable garden and buys produce from local farmers. 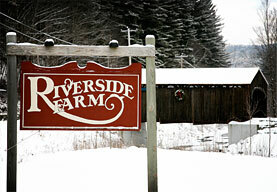 For more information please contact Liz Cotter at 802 - 746 - 8822 or email info.riversidefarm@gmail.com. A blend of city chic style with rustic country elegance- Riverside Farm is a luxurious private country estate that provides an ideal and exclusive setting for your dream wedding weekend in Vermont. Nearly three hundred sprawling acres of exquisitely manicured grounds and pristine mountain vistas make it one of the East Coast's most breathtaking country wedding estates. Specializing in the destination wedding weekend Riverside Farm offers every amenity you could ask for. For more information please contact Liz Cotter at info.riversidefarm@gmail.com or visit www.riversidefarmweddings.com. In conjunction with Riverside Farm, Peak Adventures hosts some of the most challenging and exciting races in New England. The spectacular estate is the perfect backdrop for races that tests its participant’s endurance and encourages them to challenge themselves beyond their limits. The races are held at Riverside Farm Mountain Trails, which are also excellent for hiking, biking, horseback riding and more. Andy Weinbergat andy@peak.com or visit www.peak.com or www.peakraces.com. 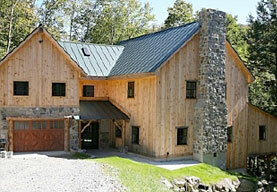 Pittsfield Property Rentals provides you with a selection of exquisite properties that offer breathtaking mountain views, private locations, unique accommodations, professional concierge servicesand only the finest amenities. 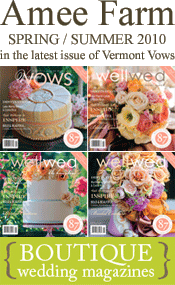 Our property consultant can help you find the perfect Vermont wedding rental, family vacation rental and organize property tours. With health and beauty spas, golf, shopping, and world class dining, we encourage you to treat yourself to all that the Green Mountains has to offer. For more information please contact Liz Cotter at info.riversidefarm@gmail.com.